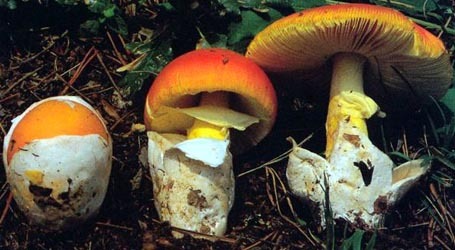 english name "Greenland Ringless Amanita"
The cap of A.groenlandica is (30-) 50 - 90 (-120) mm wide, hemispheric, expanding to convex and broadly umbonate, finally applanate with or without a low umbo, slightly viscid when young, becoming shiny when dry, with a weakly sulcate margin (10 - 20% or the radius). The cap coloring ranges from pale straw to straw, especially near the margin or when young to grayish yellow, often darkest over disc. The flesh is white, pale brown under the pileipellis, and rather soft. The volva is present as one or a few broad patches or as numerous small flat scale-like patches, whitish to pale grayish brown to gray. The gills are free, white then very pale cream, distally slightly ventricose. Short gills are present. 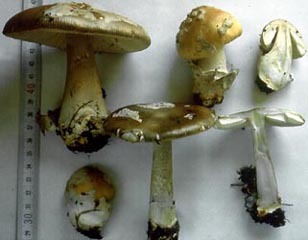 The stem is 40 - 150 × 8 - 20 mm (up to 33 mm at base), narrowing upward rather unmarkedly, ground color whitish with floccose girdles ranging from dirty gray brown to pale brown, becoming darker when buised, exannulate. The volva is fragile and easily disrupted, generally whitish at base and grayish above, with a grayish interior surface paler than the exterior; it dries darker than when fresh, sometimes with a thin outer brown layer. The spores measure (7.8-) 9.2 - 12.5 (-23.0) × (7.8-) 8.2 - 11.5 (-16.0) µm and are inamyloid and globose to subglobose to broadly ellipsoid (rarely ellipsoid). Clamps are not observed at bases of basidia. 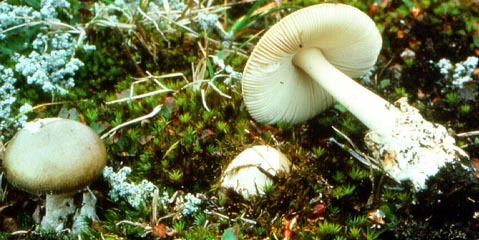 Amanita groenlandica was originally described from Greenland where it occurs with birch and willows in subarctic habitat. It has now been found from Alaska to Scandinavia and is probably circumpolar in distribution. author Bas ex Knudsen & T. Borgen in Laursen et al. 1987. Arct. Alp. Fungi 2: 241, fig. 2. ≡Amanita groenlandica Bas nom. prov. in Clémençon. 1977. Spec. Concept Hymenomyc. : 87.
etymology adjectival form of the name "Greenland"
type studies Tulloss. 1994. Mycotaxon 52: 329, figs. 16-18.
pileus (30-) 50 - 90 (-120) mm wide, ranging from pale straw [e.g., 10YR 8/2-2.5 with disc olivaceous brown (10YR 4.5/4)] to straw (3A2-3) especially near the margin or when young to grayish yellow (4B5) or most commonly with deeper brown and gray colors like fulvous (5D4-7), clay buff (5C3-4), drab (5D3), hazel (5E4) or snuff brown (6E4), often darkest over disc, but also uniformly colored or with mixed gray, brown and yellowish colors, hemispheric, expanding to convex and broadly umbonate, finally applanate with or without a low umbo, slightly viscid when young, becoming shiny when dry; context white, pale brown under the pileipellis, rather soft; margin weakly sulcate (0.1 - 0.2R); universal veil present as one or a few broad patches (at times stretched thin) or as numerous small flat scale-like patches, whitish to grayish white to pale grayish brown (5B2) to gray. lamellae free, white to off white (paler than 10YR 8/2) then very pale cream, drying 5A3 to a little browner than 5A4 to 5C4 to 10YR 6/8 (somewhat sordid tan) to 10YR 8/6 (slightly sordid pale yellow) to a little more gray than 10YR 8/6, with pale gray-brown edge, up to 8.5 mm broad, distally slightly ventricose; lamellulae present. stipe 40 - 150 × 8 - 21 mm (up to 33 mm wide at base), narrowing upward rather markedly, ground color whitish to pale straw (10YR 8/2) with pale dirty gray brown (5B2), pale grayish buff (e.g., 10YR 8/3 near apex and 10YR7.5/2 below), pale grayish, or pale brown (4A3) floccose girdles becoming darker when bruised, finely sulcate at apex, occasionally flocculose; context color not recorded, stuffed; exannulate; universal veil fragile and easily disrupted, generally whitish at base and grayish to pale ochraceous gray above, interior surface grayish but paler than exterior, drying darker gray than when fresh, sometimes with thin outer orange brown layer; limbus internus often present, white, floccose, 2 - 3 mm broad, low on stipe or inside volval sac. odor/taste Odor not distinctive, weak. Taste not distinctive, mild. tests Phenol in stipe flesh - pale salmon color after 5 min., later close to purple (but browner), days later remaining chocolate brown. pileipellis 30 - 65 µm thick, containing orange-brown pigment; filamentous, undifferentiated hyphae 1.8 - 4.8 µm wide, tightly interwoven, subradially arranged, slightly to extensively gelatinized at surface, with some apparently having yellowish walls; vascular hyphae 3.0 - 7.8 µm wide, branching, uncommon. pileus context in region close to pileipellis, similarly colored to the latter; filamentous, undifferentiated hyphae 1.2 - 10.5 µm wide, loosely interwoven, branching, occasionally with yellowish walls; acrophysalides ventricose to ovoid, thin-walled, e.g., 82 × 40 µm, sometimes in short chains; vascular hyphae 2.0 - 10.2 µm wide, with slight brownish tint in 3% KOH, sinuous, branching, uncommon, but relatively frequent in some regions. lamella trama bilateral; angle of divergence quite variable (rather shallow to nearly 90°), with divergent segments inflated to partially inflated to uninflated; filamentous, undifferentiated hyphae 1.5 - 13.2 µm wide, branching, sometimes with those of largest diameter having slightly thickened walls, with some segments slightly inflated; inflated elements ellipsoid to ovoid to clavate to pyriform, often intercalary, occasionally seeming to be truly terminal, inflated cells, thin-walled or with walls slightly thickened, with some broadly fusiform (rugby ball-shaped) cells embedded in central stratum, up to 64 × 36 µm (mostly with minor diameter about two-thirds this size or less); vascular hyphae 1.2 - 12.0 µm wide, unevenly distributed, locally relatively common, occasionally locally tangling, branching. When immature[?? just poorly inflated? ]: without marked divergence from central stratum, with wcs = 130 - 160 µm, containing both hyphae and occasional inflated elements, many (all?) of which are intercalary. When mature: clearly divided into a central stratum (with wcs = 70± µm) and a pair of adjacent regions of diverging elements (in some sections, some apparently terminal). subhymenium When immature: frequently septate, filamentous, undifferentiated hyphae, moderately branching, with some inflated to partially inflated intercalary elements, occasionally locally forming one to four layers of small ventricose cells that lie in outermost part of central stratum, with wst-near = (0-) 5 (-20?) and wst-far = 45± µm, with longest basidia having bases adjacent to elements running parallel to central stratum and (consequently) with some subhymenial elements arising from hyphae appearing to be at some distance into central stratum; basidia arising from very short, uninflated or slightly inflated, often simple, occasionally branched, hyphal segments. When mature: branching structure of inflated to partially inflated to (occasionally) uninflated elements, with wst-near = 30 - 60 µm and wst-far = 55 - 95 µm, in some regions nearly pseudoparenchymatous (but with branching structure still evident), with intercalary inflated cells up to 28 × 21 µm, with inflated cells nearest central stratum often having major diameter roughly parallel to central stratum. basidia 40 - 78 (-86) × 12.0 - 19.0 µm, 4-sterigmate, thin-walled, with sterigmata up to 10.5 × 2.5 µm; clamps not observed. universal veil At stipe base, exterior surface: loose weave of hyphae small number of hyphal diameters thick, having gaping openings irregularly spaced,orange-brown to yellow-brown, significantly darker than interior; filamentous, undifferentiated hyphae 1.8 - 9.5 µm wide, branching, occasionally in fascicles (but most often not), slightly gelatinized, thin-walled or with walls slightly thickened (rarely to 0.5 µm thick) or with plaques as in stipe context (but thinner); inflated cells ellipsoid to broadly ellipsoid to subglobose, often with pale gray walls, up to 64 × 45 µm, thin-walled, occasionally gelatinized; refractive hyphae (at least some of narrower diameters appearing vascular) 2.5 - 9.0 µm wide, infrequent, occasionally branching, with slightly thickened walls, occasionally in fascicles with colorless filamentous, undifferentiated hyphae. At stipe base, interior: filamentous, undifferentiated hyphae 2.8 - 13.0 µm wide, some segments with mid-portion swelling up to 16.0 µm wide, branching (often from broadest point of segment), in a very loose tangle, dominating, with walls thin or up to 1.0 µm thick, occasionally with yellowish subrefractive walls; inflated cells terminal, clavate to elongate to narrowly ellipsoid to ellipsoid to pyriform to subglobose, pale brown to pale gray, thin-walled or with walls up to 0.5 µm thick, collapsing, plentiful, up to 64 × 35 µm; vascular hyphae 3.0 - 8.5 µm wide, unevenly distributed, not common. At stipe base, inner surface: a very loose weave of hyphae, broken further by gelatinization, spotted with small orange brown clumps of gelatinized hyphae. On pileus, upper surface: scattered fragments of collapsed fascicles of filamentous, undifferentiated hyphae. On pileus, interior: filamentous, undifferentiated hyphae 1.8 - 16.2 µm, as in interior on stipe base except more densely interwoven in some regions, often having somewhat sordid yellowish walls and refractive deposits on inside of walls, with inflated and branched segments up to 16.5 µm wide; inflated cells predominantly terminal, sometimes chains of two, thin-walled or with walls slightly thickened, with pale brownish tint, clustered in regions of loosely interwoven hyphae, subfusiform to narrowly clavate to clavate to elongate to ellipsoid to ovoid to subglobose, up to 81 × 59 µm; vascular hyphae rare or absent. On pileus, lower surface: similar to the interior in mature material, but extensively to totally gelatinized. stipe context longitudinally acrophysalidic, with those elements lacking refractive contents occasionally having surface plaques < 0.5 µm thick; filamentous, undifferentiated hyphae 1.5 - 6.0 µm wide, branching; acrophysalides narrow, dominating, thin-walled or with walls very slightly thickened (< 0.5 µm), up to 191 × 29 µm; vascular hyphae 2.0 - 10.5 µm wide, with brown tint in 3% KOH, scattered or uncommon. basidiospores from type study of Tulloss (1994): [240/10/8] (7.8-) 9.2 - 12.5 (-23) × (7.8-) 8.2 - 11.5 (-16.0) μm, (L = 9.7 - 11.4 (-12.2) μm; L' = 10.9 μm; W = (8.9-) 9.3 - 10.6 μm; W' = 9.0 μm; Q = (1.0-) 1.02 - 1.20 (-1.44); Q = 1.08 - 1.12 (-1.15); Q' = 1.11). composite of data from all material revised by RET: [360/18/14] (7.8-) 9.4 - 13.0 (-23) × (7.3-) 8.2 - 11.8 (-16.0) µm, (L = (9.7-) 10.3 - 11.8 (- 12.2) µm; L’ = 11.1 µm; W = (8.7-) 9.3 - 10.8 µm; W’ = 10.0 µm; Q = (1.0-) 1.02 - 1.22 (-1.44); Q = ( 1.07-) 1.08 - 1.12 (-1.16); Q’ = 1.11), inamyloid, hyaline, colorless, smooth, thin-walled, mostly at least somewhat adaxially flattened, globose to subglobose to broadly ellipsoid, rarely ellipsoid; apiculus sublateral, small, cylindric to truncate-conic; contents granular to mono- and multiguttulate; white or whitish (paler than 2B of Romagnesi (1967)) in deposit. ecology Solitary to subgregarious. Newfoundland & Labrador, Canada: At 10 - 15 m elev. On “islet” of woody vegetation in bog with Abies balsamea, Alnus rugosa, dwarf Betula sp., Larix laricina, Saracenia purpurea, Sphagnum sp., Vaccinium sp., etc. Northwest Territory, Canada: On dry rock ledge (eastern exposure) with Salix sp., Hierochloe alp. ?, Poa sp., Cladonia sp., Racomitrium lanugin, etc. or in turfy tundra heath on S slope with Salix sp., Betula glandulosa, etc. [ Québec, Canada: ??.] Greenland: At 20± m elev. With combination of Salix glauca, S. herbacea, S. arctophila, Betula glandulosa, B. nana, and B. pubescens; in moist shrubs or in dry and exposed heath or in snow-beds with S. herbacea or with Salix on low E facing slope. Norway: In alpine vegetation. Sweden: With S. herbacea and B. nana. Alaska, U.S.A.: ??. material examined CANADA: NEWFOUNDLAND & LABRADOR— Isl. of Newfoundland - GMNP?, Reed’s Tr., 31.viii.2003 Andrus Voitk s.n. (in herb. A. Voitk); GMNP, Western Brook Pond Tr. [49°47’10˝ N/ 57°52’05˝ W] 27.ix.2003 P. Burchell, K. Kalamees, A. Kollom, B. Kullman, V. Liiv, V. Soots, A. & M. Voitk, R. Tulloss [Tulloss 9-27-03-A]. NORTHWEST TERRITORY—Franklin Distr. - Repulse Bay, 2± km ESE of settlement on slope SW of Lk. Naujasiti [66°31’ N/ 86°13’ W], 2.viii.1974 E. & M. Ohenoja 74/87a (DAOM 159718; OULU n.v.); Keewatin Distr. - Baker Lk., 500±A± m E of Landing Lk. Stream [64°19’ N/ 95°58’ W], 20.viii.1974 Martti Ohenoja 74/16 (DAOM 159717; OULU n.v.). QUÉBEC—??. GREENLAND: KUJALLEQ— Eqaluit, 7.viii.1982 T. Borgen 82.29 (paratype, C), 12.viii.1981 T. Borgen 81.134 (paratype, C); Grønnedal, 7.viii.1984 T. Borgen 84.72 (paratype, C); Hospitalsdalen, ca. Narssarssuaq 10.viii.1984 H. knudsen & T. Laessøe [Knudsen 574] (holotype, C); N of Igaliko, 28.vii.1981 H. Dissing Gr.81.86 (paratype, C); the former Paamiut Municipality, Paamiut, 10.viii.1982 T. Borgen 82.46 (paratypes, C; TBOR), 27.viii.1990 T. Borgen 90.63 (C; TBOR). QEQQATA— Isungua, Ø. Disko, 5.viii.1981 Jon Feilberg 3001a & 3001b (paratype, C); Holsteinsborg, Præstefjord, 28.viii.1972 P. Milan Petersen “Blå 45” (paratype, C). NORWAY: TROMS—near Tromsø, Fylke, Gaolusjavri, 17.viii.1992 J. Stordal 26178 [=H. Knudsen 92-60] (C). SWEDEN: NORRBOTTEN—Björkliden, ca. Abisko, below Rakaslako, 24.viii.1981 M. Moser 81/280 (IB as “A. nivalis”). U.S.A.: ALASKA—??. select a collection to review/add spore measurements..#706331. P. Burchell, K. Kalamees, A. Kollom, B. Kullman, V. Liiv, V. Soots, A. ..#706332. E. & M. Ohenoja, #74/87a, CANADA, NORTHWEST TERRITORY, Franklin Distr.,..#785870. Andrus Voitk, #s.n., CANADA, NEWFOUNDLAND & LABRADOR, Isl. of Newfoundl..#785871. P. Burchell, K. Kalamees, A. Kollom, B. Kullman, V. Liiv, V. Soots, A. ..#785872. E. & M. Ohenoja, #74/87a, CANADA, NORTHWEST TERRITORY, Franklin Distr.,..#785873. Keewatin Distr., #s.n., CANADA, NORTHWEST TERRITORY, Franklin Distr., K..#785874. #ENDFONT? ?, CANADA, QUÉBEC, ??#785875. T. Borgen, #82.29, GREENLAND, KUJALLEQ, Eqaluit#785876. T. Borgen, #81.134, GREENLAND, KUJALLEQ, Eqaluit#785877. T. Borgen, #84.72, GREENLAND, KUJALLEQ, Grønnedal#785878. H. knudsen & T. Laessøe, #s.n.=>Knudsen 574, GREENLAND, KUJALLEQ, Ho..#785879. H. Dissing, #Gr.81.86, GREENLAND, KUJALLEQ, N of Igaliko#785880. T. Borgen, #82.46, GREENLAND, KUJALLEQ, the former Paamiut Municipa..#785881. Jon Feilberg, #3001a & 3001b, GREENLAND, QEQQATA, Isungua, Ø. Disko#785882. P. Milan Petersen “Blå, #45”, GREENLAND, QEQQATA, Holsteinsborg,..#785883. J. Stordal, #26178=>=H. Knudsen 92-60, NORWAY, TROMS, near Tromsø, Fyl..#785884. M. Moser, #81/280, SWEDEN, NORRBOTTEN, Björkliden, ca. Abisko, below ..#785885. #OLIVEFONT??ENDFONT. ,,, U.S.A., ALASKA, ? ?.